When you grow up you tend to get told the world is the way it is and your job is just to live your life inside the world. Try not to bash into the walls too much. Try to have a nice family life, have fun, save a little money. That’s a very limited life. Life can be much broader once you discover one simple fact, and that is – everything around you that you call life, was made up by people that were no smarter than you. And you can change it, you can influence it, you can build your own things that other people can use. Shortly after we arrived “home” for the holidays in December of 2018, and while we were in the final planning stage for Epic Mini Life 2.0, we decided to visit our old neighborhood in Dallas. It’s a neat little place, tucked away just south of downtown (about 1/2 mile). We sold our townhouse there in 2017 to hit the road and live a life free of tethers and of any obligation to any specific place – to live everywhere and anywhere. We were going to be free! It’s the story we bought, and have told over and over. It was right at the time, and still feels right today. For the two years prior to selling that townhouse, I was the President of the Cedars Neighborhood association. I met with City officials, neighbors, land developers, and all kinds of people and companies with an interest in the area. I knew more about that neighborhood and its future than most, and yet we chose to sell our paid-for townhouse anyway. As an example, the High Speed Rail to Houston will terminate in The Cedars. There’s a world class water reclamation park coming to The Cedars, championed by Matthews Southwest, and one of the world’s largest Ferris Wheels (500 feet tall) has been approved by Dallas’ City Council. Not to mention the 2,500 new residents – construction started on those units as we said goodbye to neighbors. Suffice it to say, we had regrets about selling that townhouse – and have ever since. It’s not the “stability” of the sticks and bricks that kept us going back to that place and time, it was people, possibilities and the fact that we owned that property mortgage free. In the ensuing 19 months, we’ve really learned how to live small, tiny even. We’ve done it with some pain and expense, but we absolutely love the lifestyle and all that being a digital nomad is. We’re 100% powered by the sun, and have the means to bring in fresh water and dispose of waste water. We can park for weeks in a place, and not miss a beat, internet, work, and all. So we have a new plan, today. If all goes well, we’ll take possession of another townhouse in The Cedars on Monday. We simply couldn’t let the opportunity pass. It’s not mortgage free this time, but it gives us an investment in a neighborhood that is moving well along the path that we helped guide. The Airbnb potential for this unit is off the charts, especially for what we have planned, and the rents in the neighborhood would easily cover the mortgage. But that comes later (if at all). We didn’t buy it to rent it in any way, but that potential certainly exists. Our big adventure to the Redwoods, Big Sky, Yellowstone, Grand Canyon, Zion, and so on are on hold for now. Not because we’re done with the nomadic lifestyle, but because we really wanted to make this life ours. From a pragmatic standpoint, it is ours, but the way we’re doing it (the living quarters specifically) isn’t our ideal. It’s a great RV, and with our modifications it’s even better. We’re going to spend a few months fixing a few remaining things, and hope to find a buyer for Leeloo by the end of summer. That will free up time and money (from the sale) to begin building our epic, tiny home. Leeloo is an off-grid monster, ready to pick up and hit the free lands with a new owner! What is ideal? Our ideal home (as of right now) is a 40′ reinforced 5th wheel frame, with a completely custom tiny house built on top. Because we are who we are, you can expect some pretty creative and techie features. Things like a folding porch, paneled folding glass doors, a wood burning stove, lots of windows, a rooftop deck (accessible from the inside, like an attic), 2,400 watts of auto-tilting solar, 6 Tesla battery modules (days without sun), enough water capacity for about two weeks of freedom, and a clever gray water evaporation system. It’s going to be amazing. We’ll have slide outs (recovered from the demolition of the RV for the frame), and we’ll take a tip from the RV industry and build storage under the house, not in it. Our take is that it will be accessible from inside, through the floor. If there’s one thing you should know about me, it’s that I’ve spent the past 25+ years in software and internet innovation. It’s time to bring that to the physical world, and what better place than our home on wheels? We LOVE the nomadic lifestyle, and we’re ready to make it ours. We’re going to make it bigger and better. That means making some pretty drastic changes, and resetting our own expectations. It means building our own house, with our features, and on our timeline. It means an investment in sticks and bricks, but without the notion or expectation of being “trapped” by it. If there’s anything we’ve learned on this trip, it’s that change is inevitable. Much of how it affects you is whether the change is by choice, or by circumstance. We’re choosing our future, and being very intentional with it. 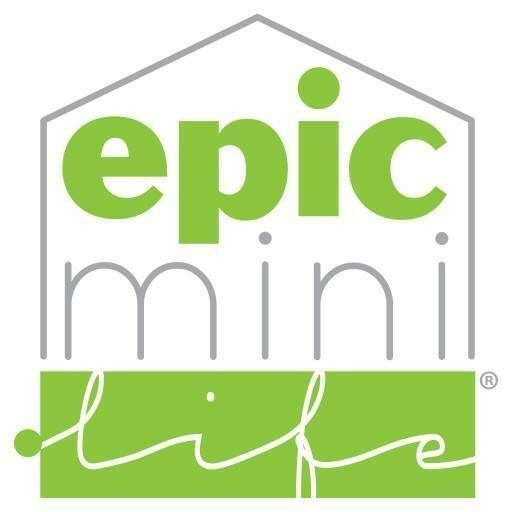 From the Epic Mini Life family… we would be thrilled to have you along for the adventure! Husband, father, epic adventurer, perpetually curious, rule breaker, startup guy, innovator, maker of things. Doer of stuff. CEO of Epic Playground. Creator of inboundgeo. Love it! SO envious of your brave and adventurous spirit. Love following along.